Take a stroll down memory lane with Flo and the rest of the DinerToons as they reminisce about the ups & downs (literally!) of their first summer job at Mr. Big’s theme park restaurants in the delightfully addictive game Cooking Dash – Thrills and Spills. Cooking Dash 3: Thrills and Spills starts with a flashback to Flo’s teenage years, when DinerLand was completely rundown and Mr. Big was at his wits end trying to improve matters. Luckily for him, even back then young Flo had a good head on her shoulders and knew exactly how to fix things! Not one to waste time, she swiftly recruits Grandma to come lend a helping hand and immediately goes on a mission to restore Dinerland to its full glory! In this extremely addictive Time Management game Flo’s job is to seat students, impatient businesswomen and starlets, while keeping an eye out for matching seat colors. If you manage to match the colors you get a bonus… the more consecutive matches, the larger the bonus! Once seated you need to take their orders as fast as possible, run over to help Grandma operate the fryer in the kitchen and then serve salads, grilled fish and colas. If customers are pleased with your service and the food, they may also ask for a slice of chocolate cake, which earns you extra bonus points! Pay close attention though as each character has a different attention span and level of patience; you are better off serving the impatient businesswoman first and leaving the retired Grandpa with all the time in the world waiting for a few seconds longer. 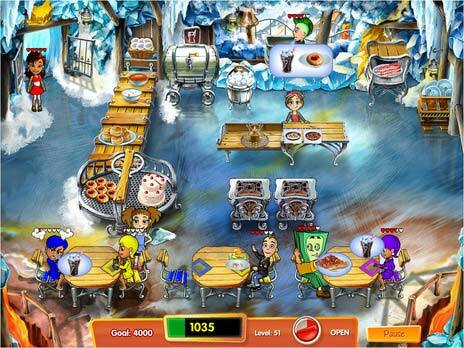 The aim of Cooking Dash 3: Thrills and Spillsis to make as much money as possible while serving customers, which you can then use to purchase upgrades for your restaurant, such as an additional grill, salad covers to keep them fresh, a double cola machine or even an extra worktop so Grandma can prepare multiple dishes at the same time. You can also invest in the décor by adding a nice hardwood floor or a new counter and of course there are also cool power-ups you can choose from that allow Flo to serve faster and Grandma to cut quicker! 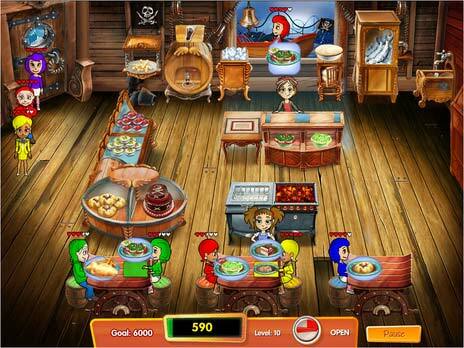 Cooking Dash 3: Thrills and Spills features 50 levels in Story mode across five different restaurants, including Jelly Rogers, Deep Dive and the Tree Tops. Alternatively, you can play in Endless mode, which easily doubles the playtime. Great add-ons that make the game even more enjoyable are the Dash-Thru, which requires Flo to juggle different serving areas and orders in addition to the various mini-games in-between levels. You can skip these but matching fried fish or finding hidden objects in the restaurants are a great way to get your hands on a number of prepared meals for the next level, depending on your performance of course. All of this may sound easy enough, but the game gets very hectic early on and you have no choice but to be quick on your feet while keeping all your balls in the air. It’s a terrific challenge for those of you who love Time Management games, and especially fans of the Diner Dash series. 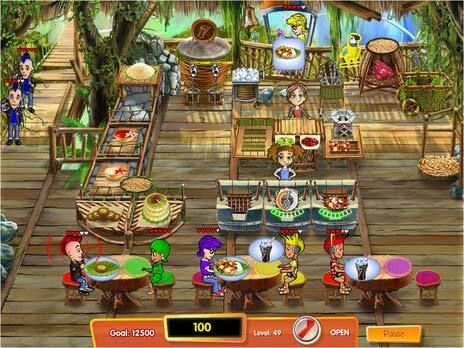 Download and play Cooking Dash 3: Thrills and Spills for FREE! I actually have the collector’s edition to this game and loved it. It’s challenging but not so challenging that You can’t finish the game. I would recommend it to any TM lover out there. I liked the game very much and hope to see more of these games. i love this game to much! I Love these games on freeride games, the game i love the best is super granny games… now that game is the one i be up all late at night gettin my kittens in a safe place.. i love to play games . thanks for these wonderful games to play on my laptop all day and night when i do can get on..
Lol i’ve been hearing that this game is cool. So, imma try and out and then il lsee the real truth! Lol i’ve been hearing that this game is cool. So, imma try it and see how it gose and if I would really like it! Wish me luck! Ill message you guys back when I try it out . . . . if I can find this page again! For now So long! i think it is a good game because it has lots of rush and i lice being rushed on games i also lice lots moore games aswel though i whill tell you a bit of imfo about my famalie.first of my 2 brothers my baby brother is called harry and his birth day is on new years eve and this year he is goeing to be 1 and my big brother is called keiran his birthday is 26th January and next year he is goeing to be 12. next of its me my name is rebecca and my birth day is on the 5th september and next year i am goeing to be 10 now its my mum and dad first its my mum her birth day is on the 2nd december and this year she is 42 next is my dad and his birthday is on bonfire night and next year he is goeing to be 45 year old and that is all about my famalie by for now seya. fun game!try it out.i swear, it is fun! 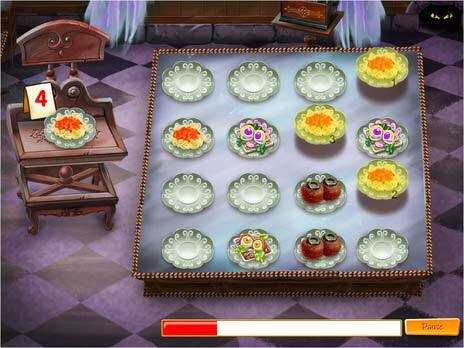 i like the games, because i loved to serve food. thanks…. este juego me parese muy aburridoo alguiien q ya lo habiia juagado me diigo q es muy aburridoo y me parese tambiiien y ademas en mii compu eso no juega…. this game are bored!! How do we play this game anyways? you can be so push in this game every doy cause its so fun to play everyday….. This game is so fun!!!!! Hells kitchen is totally fun!!!!!!!!!!!!!!!!!!!! i love these games wish all games wre fun like this one!